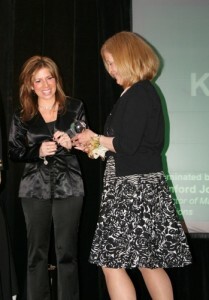 Karen Deland received her award from WDHA's Terrie Carr. Matheny School teacher Karen Deland was one of 18 New Jersey teachers honored on March 13 as part of WDHA/WMTR’s Teachers Who Rock class of 2012. Deland received her award from WDHA midday personality Terrie Carr at a special banquet held at Ravello Elegant Weddings & Banquets in East Hanover, NJ. The awards were presented because the Greater Media radio stations feel excellent teachers aren’t receiving adequate recognition for their important contribution to society. Deland first taught at Matheny in 1979, leaving in 1980 to accept a teaching position in the Franklin Township Public School District in Quakertown. After earning a law degree and raising a family, she returned to Matheny in 2009 and was named Matheny’s Educator of the Year in 2010. 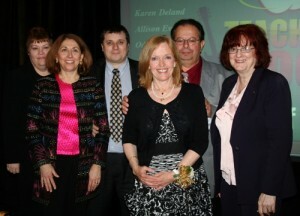 From left, Matheny administrative assistant Betty Schoonover; curriculum coordinator Linda Mullin; vice principal Sean Murphy; Karen Deland; Karen’s husband Steve Deland; and principal Sheryl Gavaras. This entry was posted in Uncategorized and tagged Karen Deland, Ravello, Teachers Who Rock, WDHA/WMTR. Bookmark the permalink.